This movie was pretty widely panned when it came out, and I’ve got to agree with most of the critics. (Have I lost you already?) 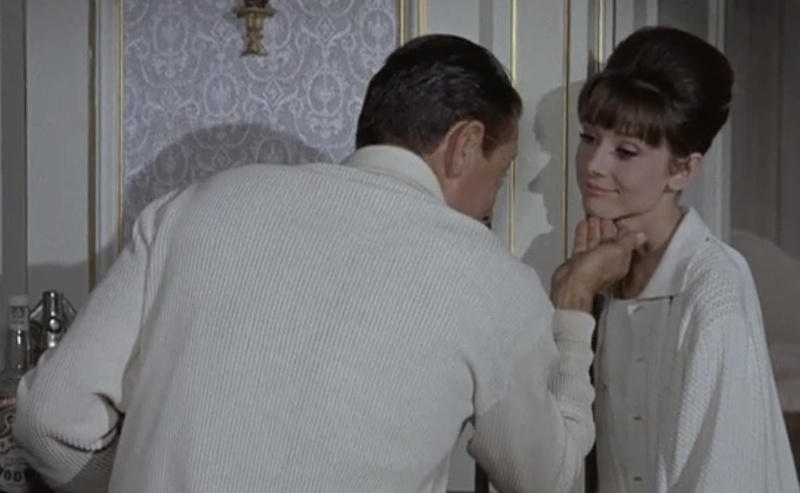 The first time I saw it I was very disappointed–how could Audrey Hepburn in Paris not be great? But as I’ve watched it since then, I can find more to enjoy. There’s plenty here, even if it isn’t a great movie. It’s certainly an interesting attempt to make an interesting film with lots of meta-moments and intertextual references. 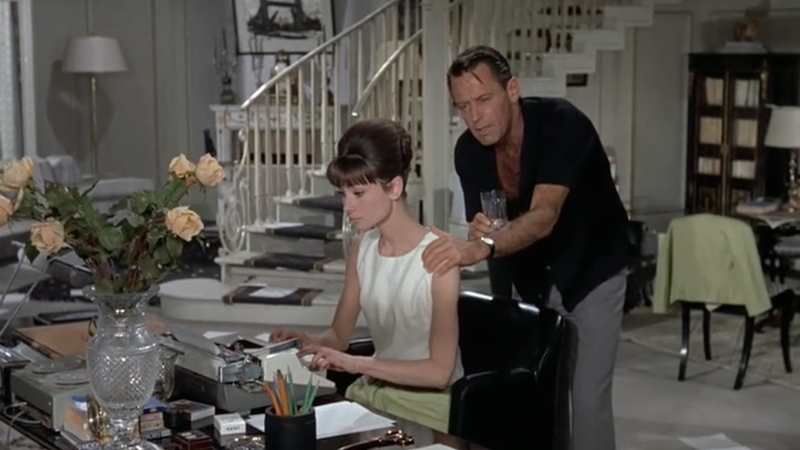 We’ve got William Holden as Richard Benson, a successful screenwriter who is resting on his previous hits and drinking his impressive fee in Bloody Marys. 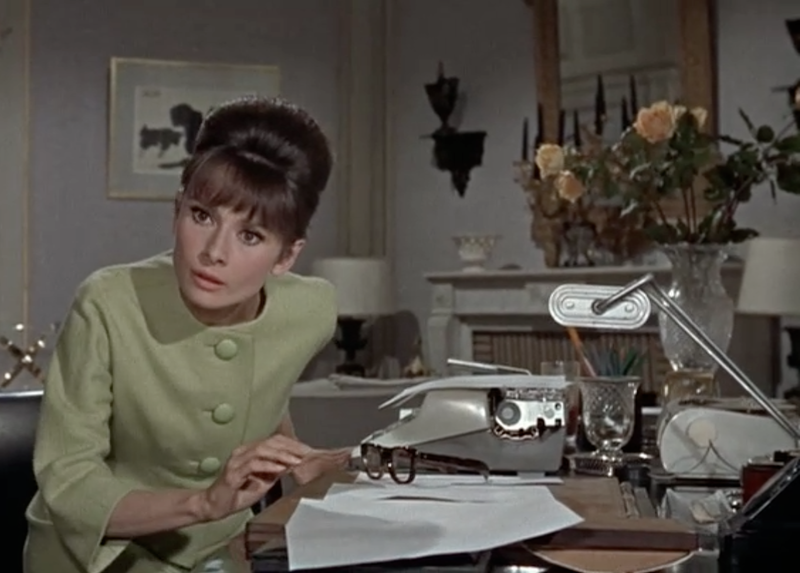 Audrey Hepburn is Gabrielle Simpson, a secretary, who is sent in to type up Benson’s new script a few days before his producer is due to arrive in Paris. 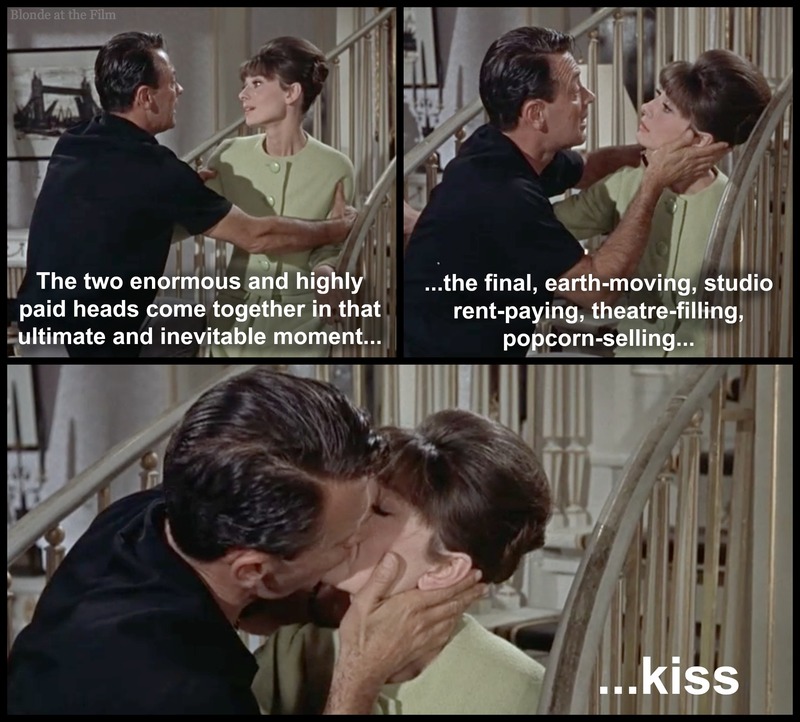 Hepburn and Holden had been a great success in 1954’s Sabrina, so they were paired again to recapture that magic. They had also conducted a not-so-secret love affair during production of that film…an affair which Holden never seemed to completely get over. He was apprehensive about working with her again, though it seems to have gone alright. 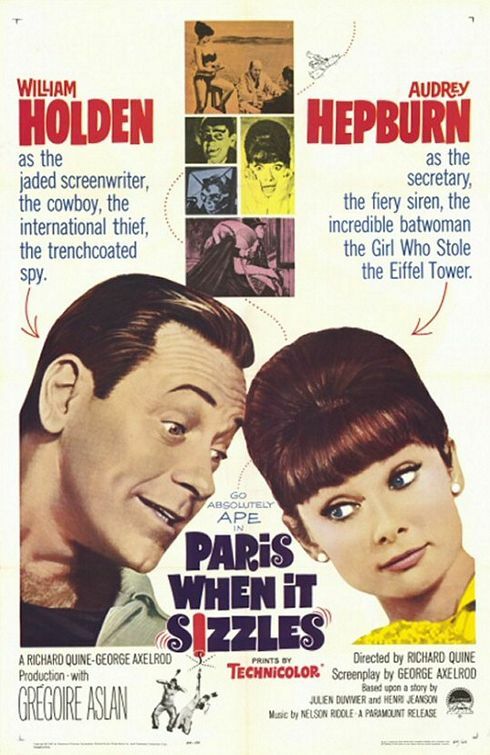 During the making of Paris When it Sizzles, Hepburn was married to Mel Ferrer, and Holden was drinking very heavily, just like his character. 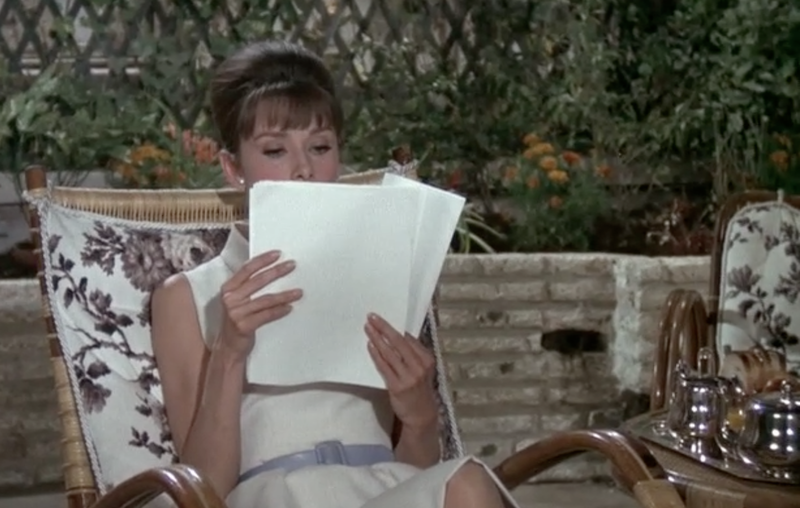 This movie was written by George Axelrod, who penned several great movies, including the adapted screenplay for Breakfast at Tiffany’s (1961), starring Audrey Hepburn. He based his script on a French film called Holiday for Henrietta (1952) by legendary French filmmaker Julien Duvivier and Henri Jeanson. We open with a helicopter shot of Cannes’ coast. Alexander Meyerheim (Noël Coward) is the producer who has commissioned Mr. Benson’s script. 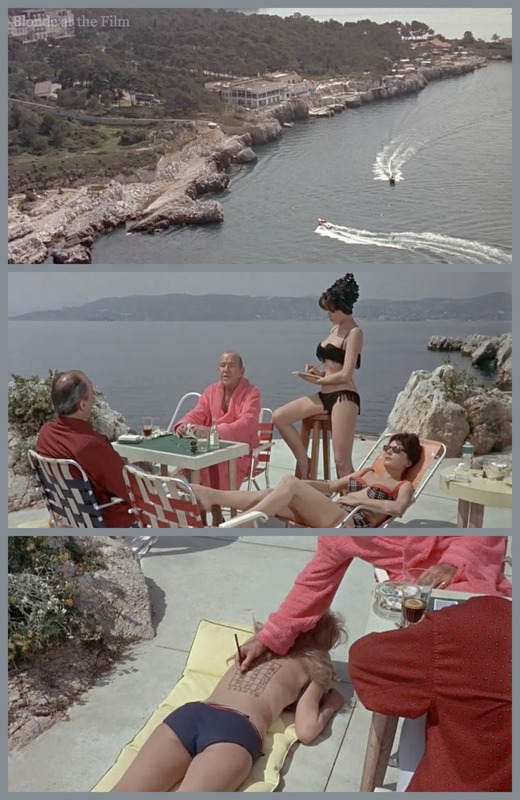 He’s doing what all big-time Hollywood producers do: lounging in a luxurious vacation spot, playing some sort of game with the scoreboard on a beautiful woman’s back, and giving dictation to a bikini-clad secretary. You know, typical stuff. He discusses his new project with his companion, who warns him about Mr. Benson’s reliability. But Meyerheim has faith in him, though he is a little anxious about the script. That’s why he’s heading to Paris in just a few days. You can watch the scene here. 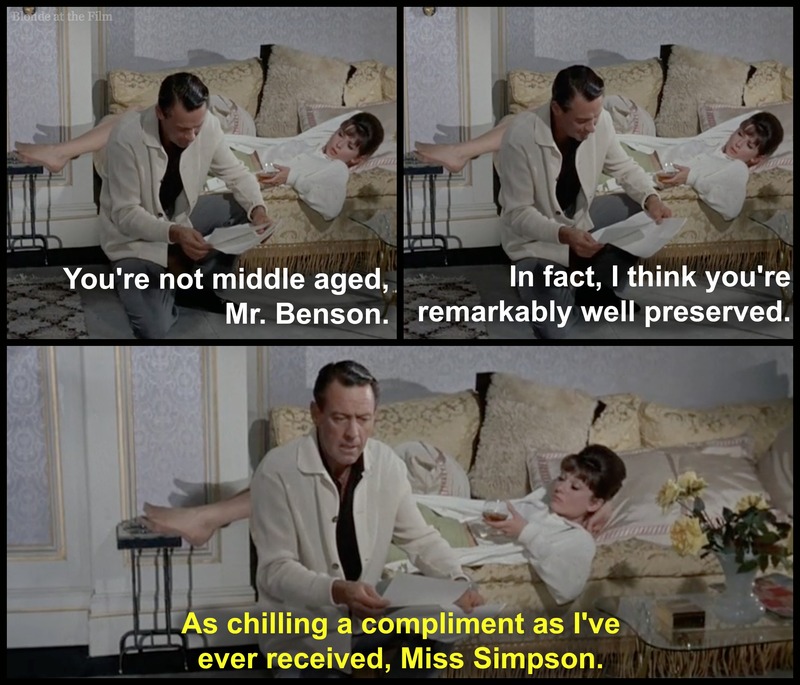 Meanwhile, in Paris, Miss Gabrielle Simpson arrives at Mr. Benson’s swanky apartment to discover that there is no script–Mr. Benson hasn’t written a line. They’ve got two days to cobble something together to hand to Meyerheim. What antics will ensue? What romance will unfurl in the City of Lights? What Givenchy couture will Hepburn parade? 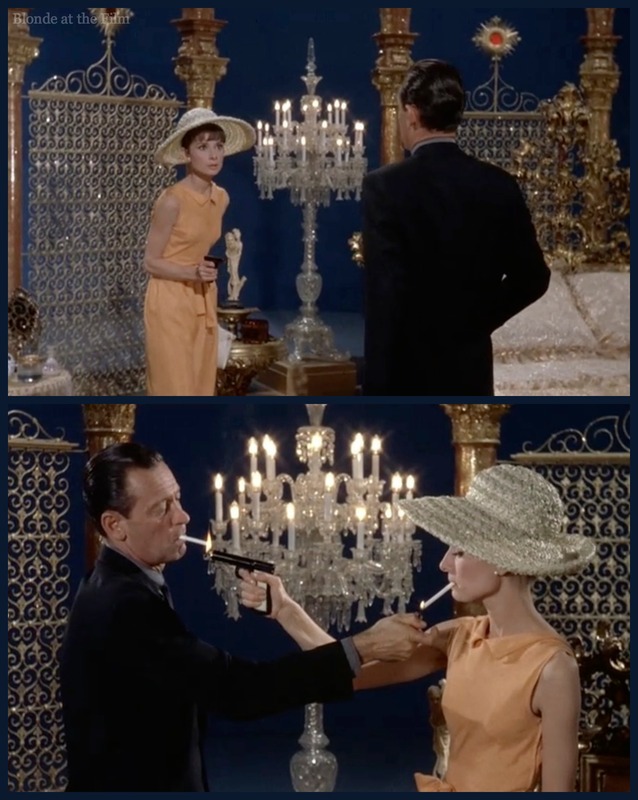 Ever since Sabrina (1954), Givenchy had designed Hepburn’s costumes and her personal wardrobe, including her clothes for Funny Face, How to Steal a Million, and Charade. He even created a scent for her exclusive use! 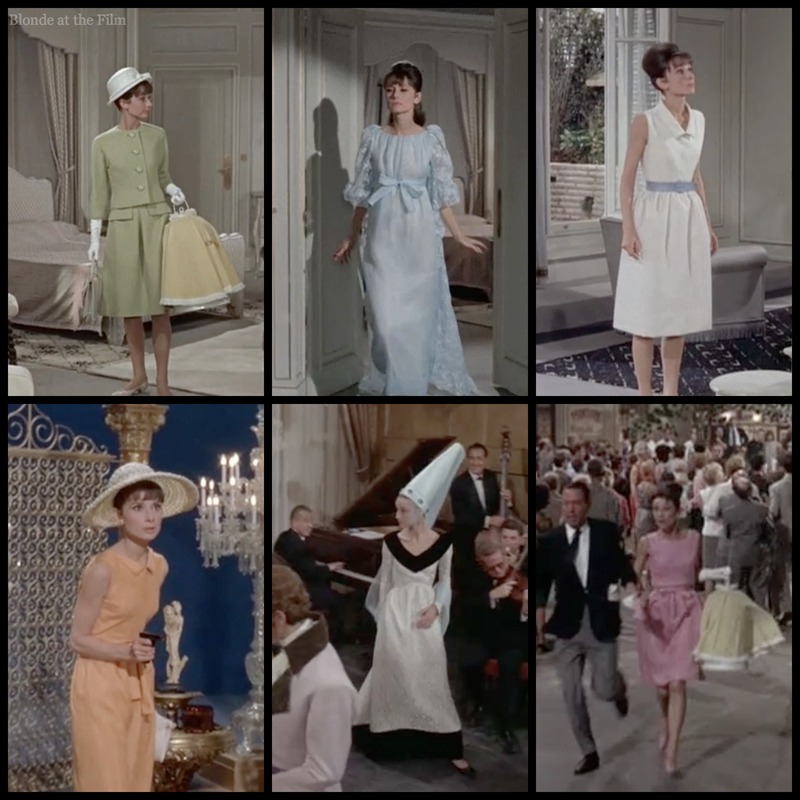 On this film, Hepburn demanded that he receive, besides the normal costume credit, an onscreen “perfume” credit! Seems pretty silly, but there it is. Richard is not amused. He’s an old-fashioned screenwriter who writes movies with action, clever dialogue, switches-on-switches, and love stories. All that New Wave stuff is a bunch of nonsense, in his opinion. He also has no love for Method actors, which will come up several times in this film. It’s interesting/amusing to watch this movie for those moments. We’ve got two big Hollywood stars who started in movies during the studio era, and who watched the movie business change around them. Anyway, it’s pretty clear that Richard has a drinking problem, and that he feels his best work is behind him. He’s tired, jaded, and buzzed, thanks to an ever-present, somehow always-filled pitcher of Bloody Marys. 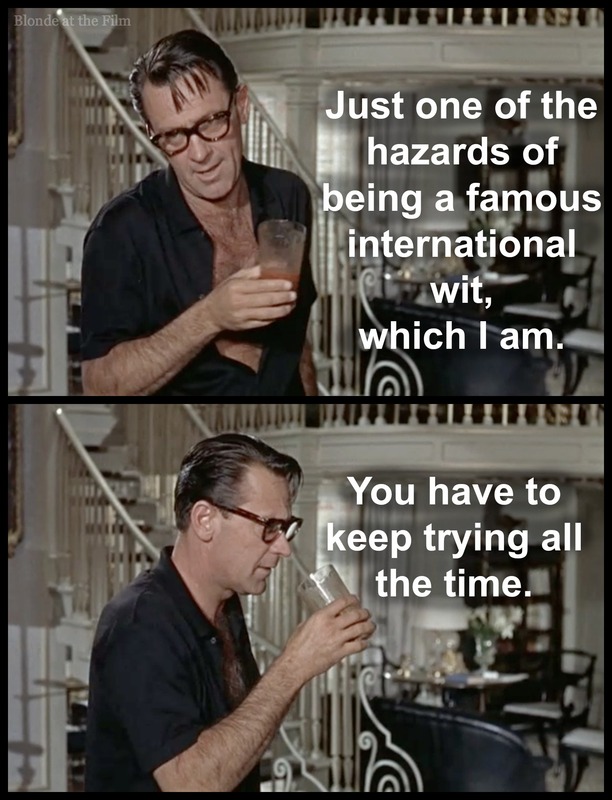 Although the movie mocks method actors, in one sad way, William Holden was being pretty method for this film. He was an alcoholic in real life, and his drinking was especially bad when he made this movie. He would show up on set in the morning, already drunk, with his pet African bush baby (a small primate) on his shoulder. The director of the film, Richard Quine, tried to keep Holden under control; he’d worked with him a few years earlier on The World of Suzie Wong (1960), but Holden was much worse now. Quine rented the house next to Holden to try to keep an eye on him, and he even forced the actor to go into a week of treatment towards the end of production. Back to the movie. Gabrielle is stunned to find out that Holden hasn’t written a single page. The script is due in two days–what are they going to do? Get to work, that’s what! Miss Simpson removes her chic jacket and off they go. 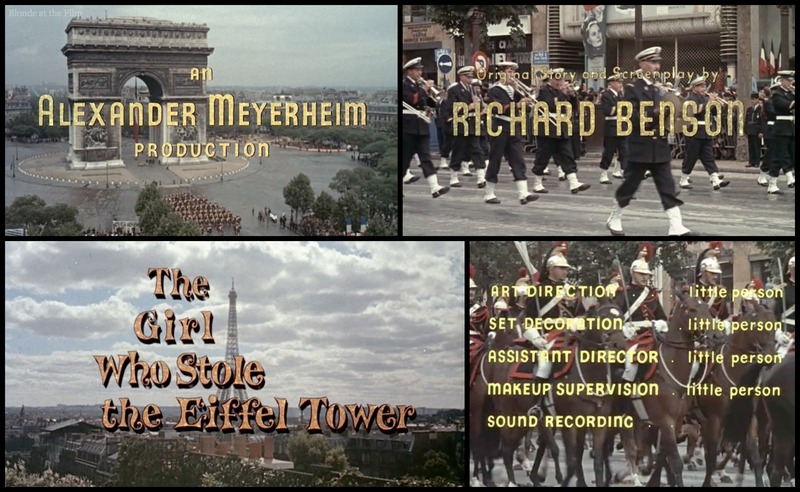 When Richard gets to the title, he says “Cut to the Eiffel Tower. The main title. The trumpets segue into the inevitable title song. Maybe we can get Sinatra to sing it.” Frank Sinatra’s voice immediately sounds, singing the first lines of a silly title song! Why, it’s actually Marlene Dietrich! It’s just one of the uncredited cameos sprinkled throughout the movie. According to Holden’s autobiography, in a scene which didn’t make it into the movie, Dietrich strolled into Dior and picked out a white ermine coat. After she finished her half day of work, she asked to keep the coat. George Axelrod, who also produced the film, assumed he’d be able to refuse that request, no problem. He went to talk to Dietrich, and came back a little while later, very pale, to announce that she was keeping the coat…and the car. You can watch the scene here. It seems a little farfetched that Miss Simpson would go along with this type of behavior, but she seems completely taken with Richard. As they chat, we find out that she came to Paris to “live” (ugh). 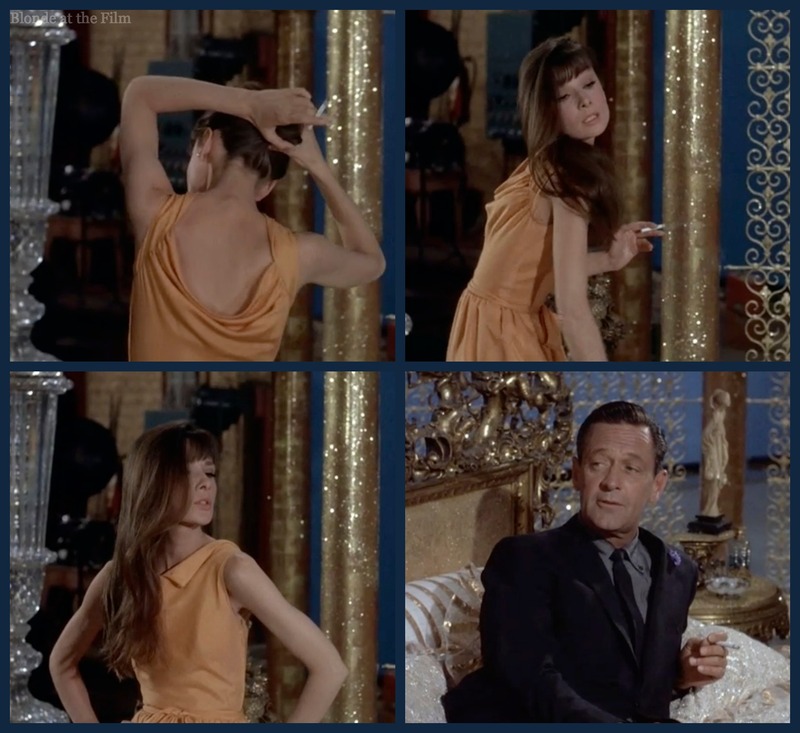 She tells Richard that she has plans to meet a handsome actor for some fun on Bastille Day, which happens to be two days from now. That sparks Richard’s imagination, and he starts dictating a movie that takes place on Bastille Day and follows a Parisian girl during the celebrations. The girl is to be named Gabby, and Richard says that she looks remarkably like Miss Simpson. Why, it is Tony Curtis! He plays the “method actor” who mumbles and pauses and sprinkles his lines with “like” and “uh.” The whole thing is really goofy, almost too goofy. One problem about this movie is that no one ever really plays it straight. It would be okay if just the film-within-the-film was goofy and over-the-top, but when the scenes with Richard and Miss Simpson verge into ridiculousness, it becomes too much. There’s no straight man. 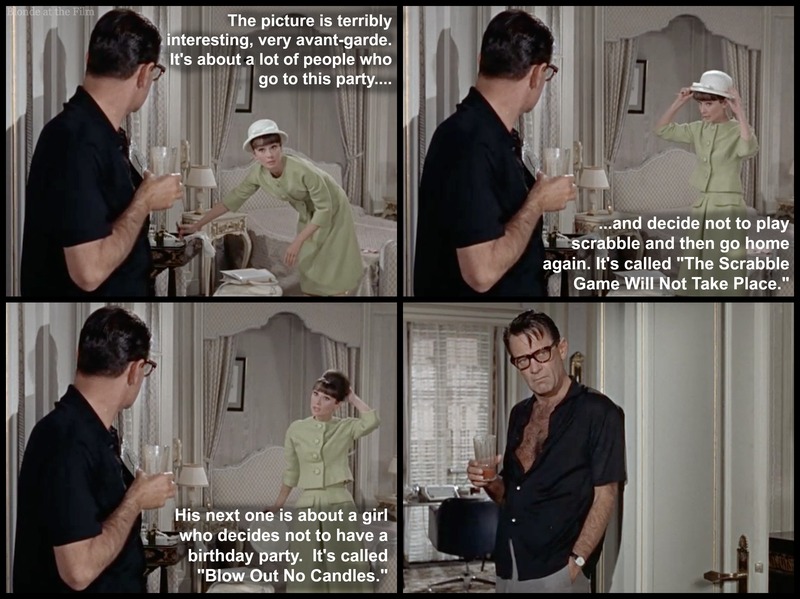 Fun fact: Tony Curtis was not originally supposed to be in the film. When Holden went away for his alcoholism treatment, George Axelrod asked Curtis to appear in the movie. He actually has a pretty big role! 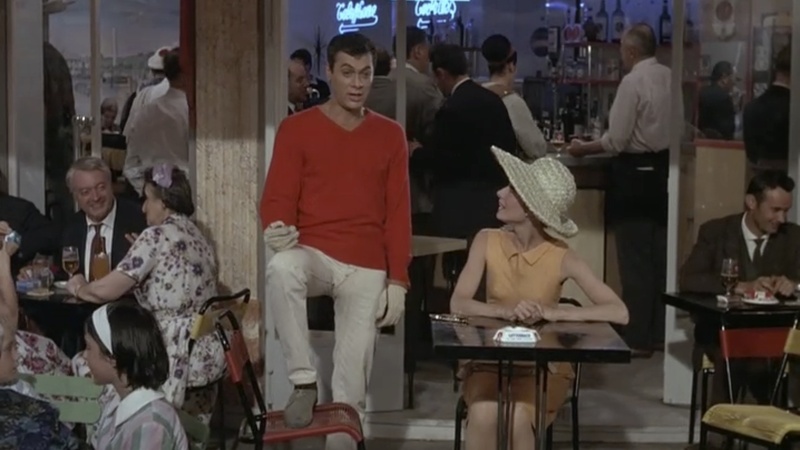 Anyway, in Richard’s script, the Tony Curtis character cancels the date with Gabby (he’s got a role in a Roger Roussan-New Wave film called “No Dancing in The Streets” about a Bastille Day when it rains…) You can watch it here. She hits him and runs, and the trench-coat people give chase. But suddenly Richard intrudes on the scene in voiceover to say: “Spies in trench coats? I’m afraid I got carried away, Miss Simpson. We’ll have to go back.” And then the scene literally rewinds. 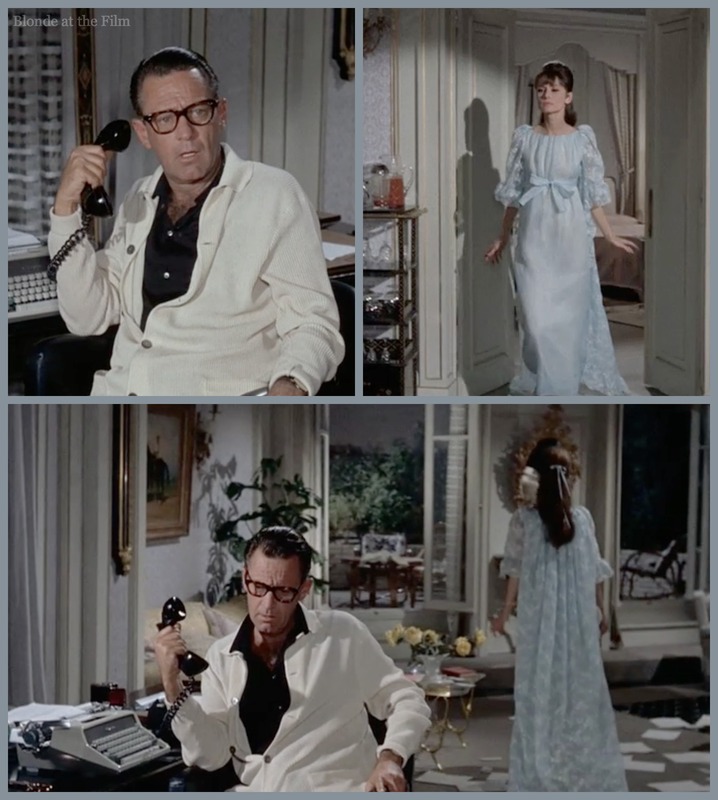 Instead of the spies, now the stranger, who is named Rick, by the way…takes Gabby to a long, luxurious lunch with flowers that match Gabby’s cantaloupe-colored dress. 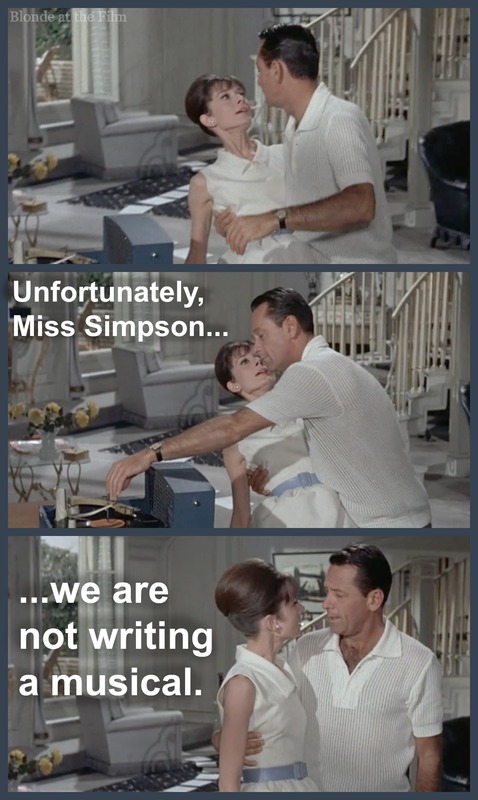 Buzzed Miss Simpson tries her hand at screenwriting, and we get to see it all happen. In her version of the movie, Rick has been plying Gabby with alcohol so that he can take her back to his cavernous lair. Suddenly, it’s a vampire movie! 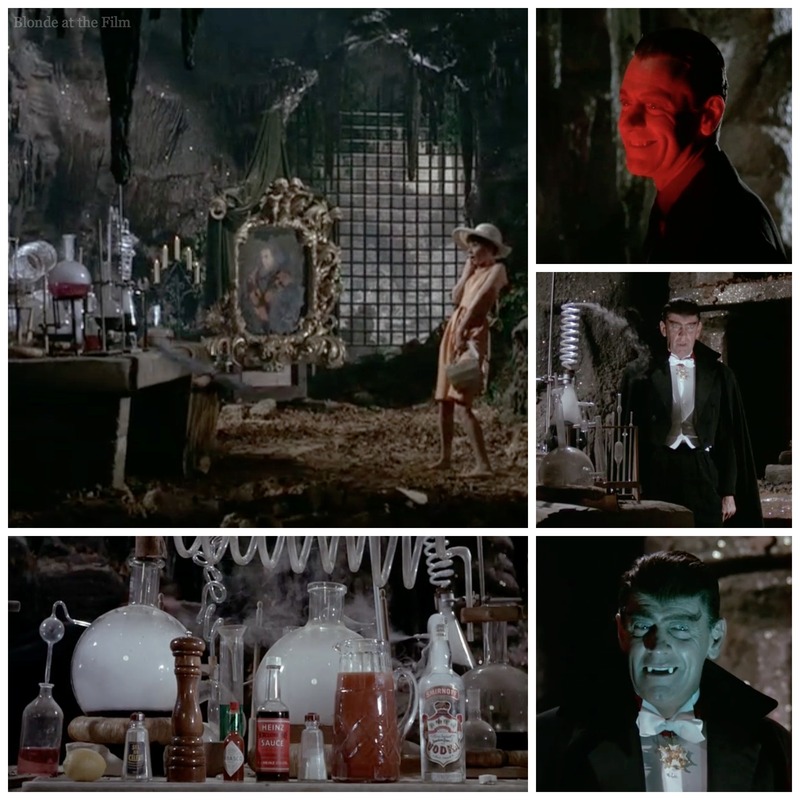 I do find this joke about the vampire’s “lab” with its Bloody Mary fixins’ pretty funny. Fun fact: this was one of the last scenes to be shot. When Holden returned from his weekend break to shoot it, he had a broken arm. (He’d crashed his Ferrari.) So they shortened it, and they hide his slinged-arm under the cape. Miss Simpson continues with her wild story. Gabby escapes the lair and jumps into a carriage. She takes off, followed by Rick on a horse. Suddenly, it’s a western, complete with Indians! At this point, Richard decides it’s time for Miss Simpson to go to bed. That’s probably a good idea. She retires to her room and we get this nice shot of her updo. In no time at all, Miss Simpson changes into her jammies, but realizes she’s forgotten her canary outside…Richard is stunned by her pretty nightie, and I’m impressed by the matching hair ribbon, and the impossible volume of hair it holds back. Anyway, the next morning Miss Simpson awakes, chooses a pretty white frock, and leaves her room to discover a trail of pages! As she follows the trail, “That Face,” sung by Fred Astaire, plays on the record player. 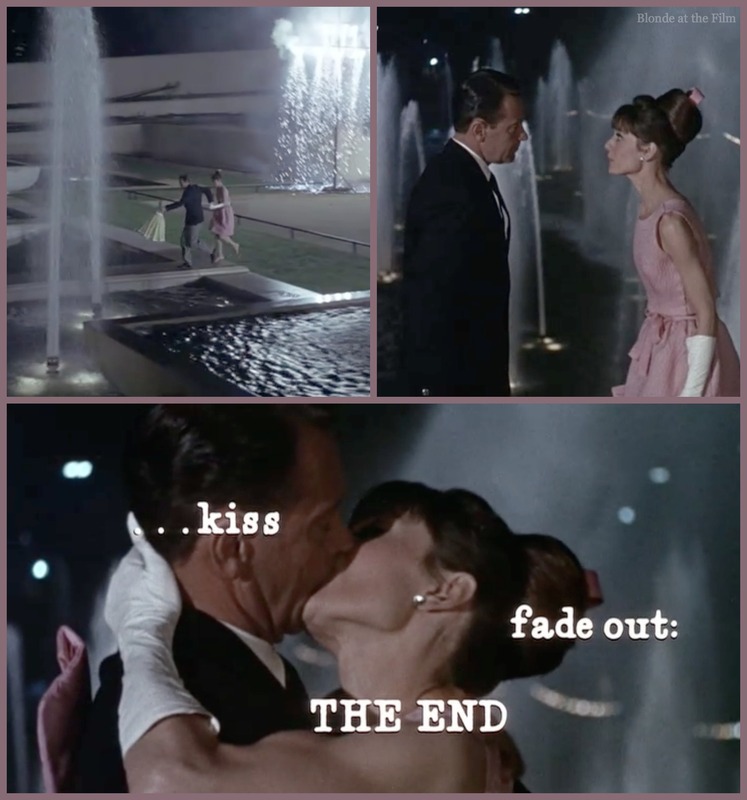 The song is a reference to Hepburn’s film Funny Face (1957) in which Fred Astaire was a fashion photographer and Hepburn was a reluctant model. 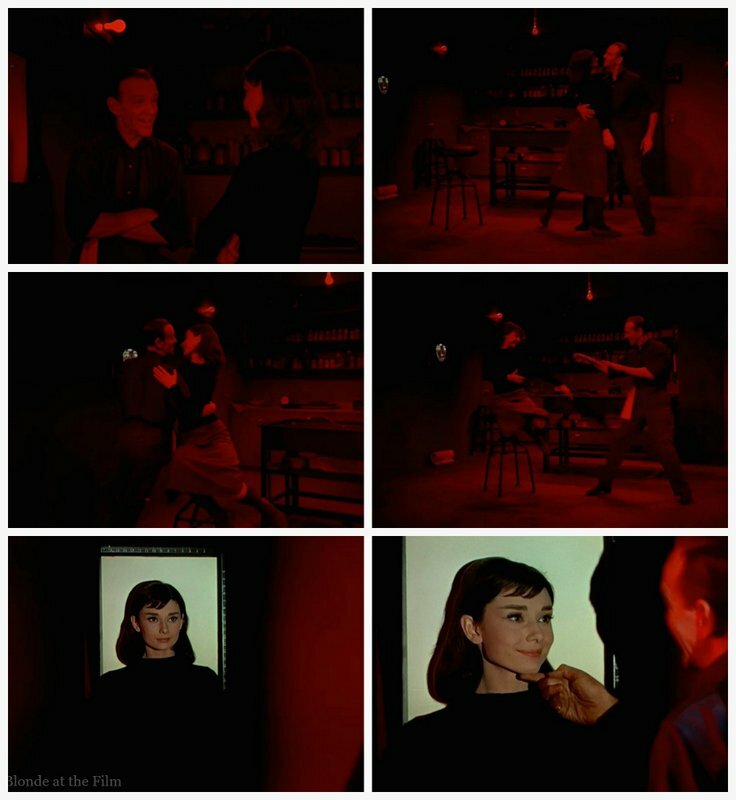 There’s a scene in Funny Face where Astaire is developing huge close-ups of Hepburn’s face, and eventually he and Hepburn dance to the song “Funny Face” in his lab. You can watch it here. 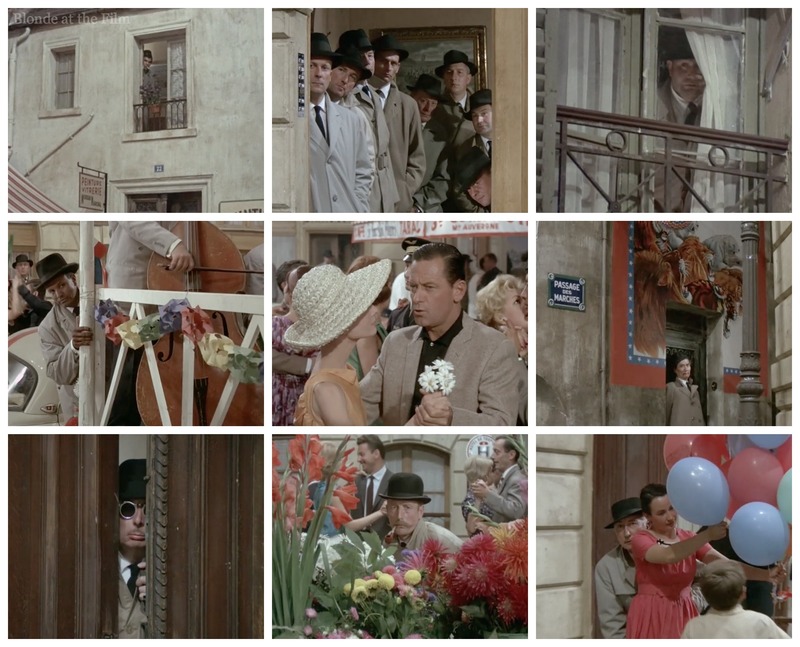 Here is the Funny Face scene. It takes place in a darkroom. No more dancing! So far we’ve hit a lot of genres: romantic comedy, thriller, vampire, western, war, racing, and musical. It’s rather like what the barber did to Hepburn’s bangs in Roman Holiday, eh? Richard picks up the story at that luxurious lunch. In this latest version, Rick is an international criminal being watched by the police. His big job is tonight, and he’s picked up Gabby as camouflage to fool the Inspector dogging his tail. But here’s a switch! Gabby is a police informant, and her actor date (Tony Curtis) is a policeman! They’re all working together to bring down Rick! Rick takes Gabby to a movie studio. His plan is to steal all the prints of a just finished film called “The Girl Who Stole the Eiffel Tower” and then blackmail the producer. It’s all going swimmingly until Gabby makes a mistake and Richard realizes that she’s working with the police. Off they go on a chase through the backlot. 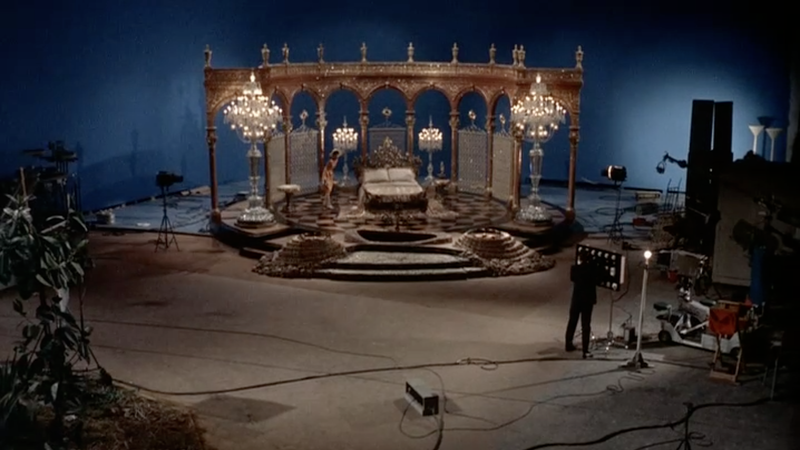 It reminds me of the “You Were Meant for Me” number in Singin’ in the Rain (1952) with its use of movie magic on the backlot, but without the dancing. 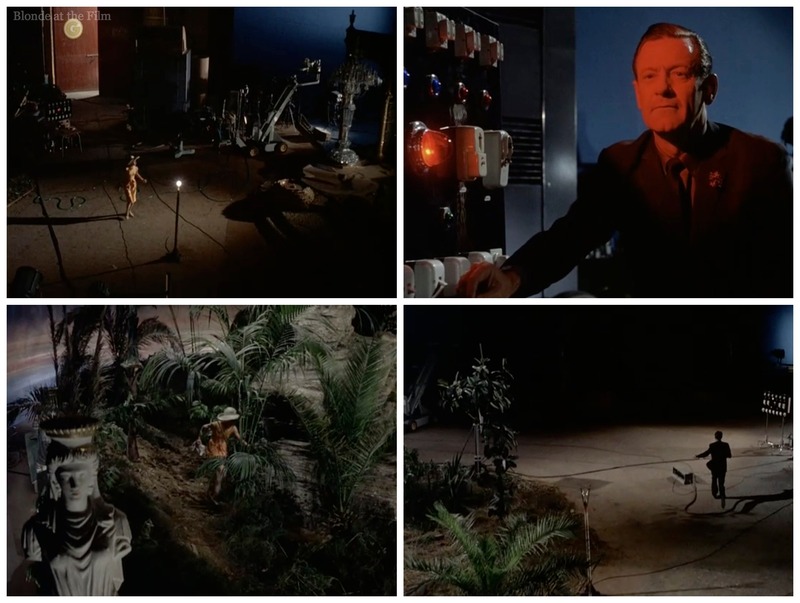 Gabby flees through a jungle set and cornered in an absurd bedroom. Anyway, Gabby takes down her hair, revealing the draping on the back of her dress before flipping her hair around with sultry abandon. She tells Rick that although she is a creature of the streets, she’s still a professional. Eventually they find themselves tangled on the bed…dissolve. Miss Simpson is astounded at the turn of events! She’s also worried that the censors would never allow that last scene, but Richard ensures her that the dissolve keeps them decent. They could be playing parcheesi on the bed, after all! It’s rather amusing, because dissolves are, and remain, a handy technique for signaling that time has gone by or for covering up something risqué. Earlier in the movie, Richard had elaborated on the usefulness of dissolves for speeding up time, then the film used a dissolve to cut from the beginning of Richard and Miss Simpson’s lunch to the end. Meta fun! 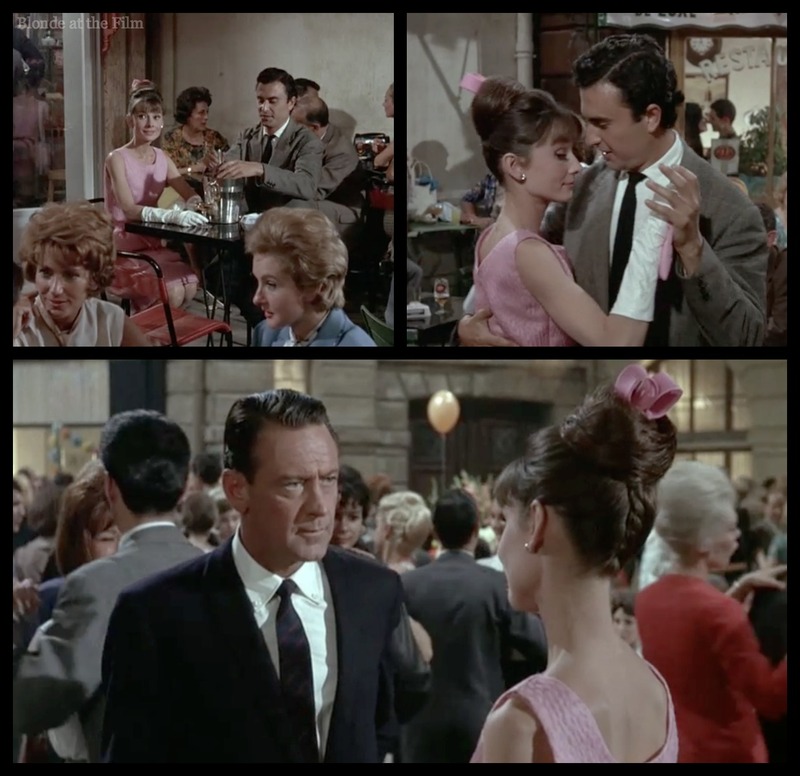 …Gabby and Rick head to the costume party at the Eiffel Tower. Rick raids the studio’s costume collection. He’s a cowboy, she’s a princess or something. 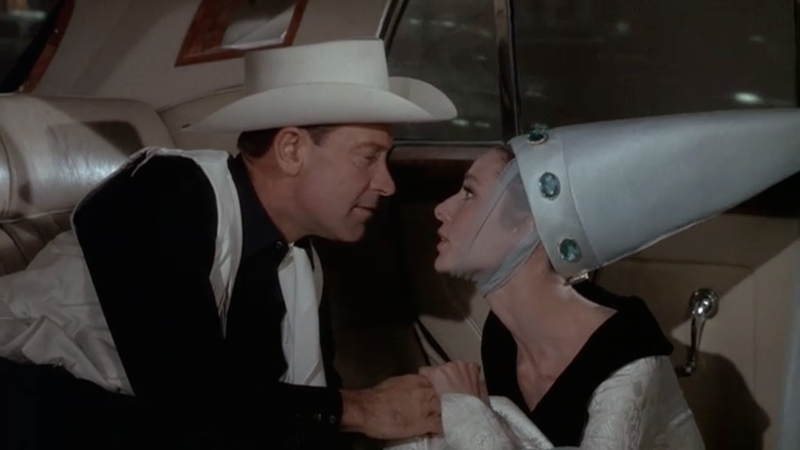 I’m disappointed in Hepburn’s costume for this scene. It looks like something you could buy at any Renaissance Faire, and they could have taken anything from the studio’s costume department! They had a perfectly rational excuse to do something crazy. 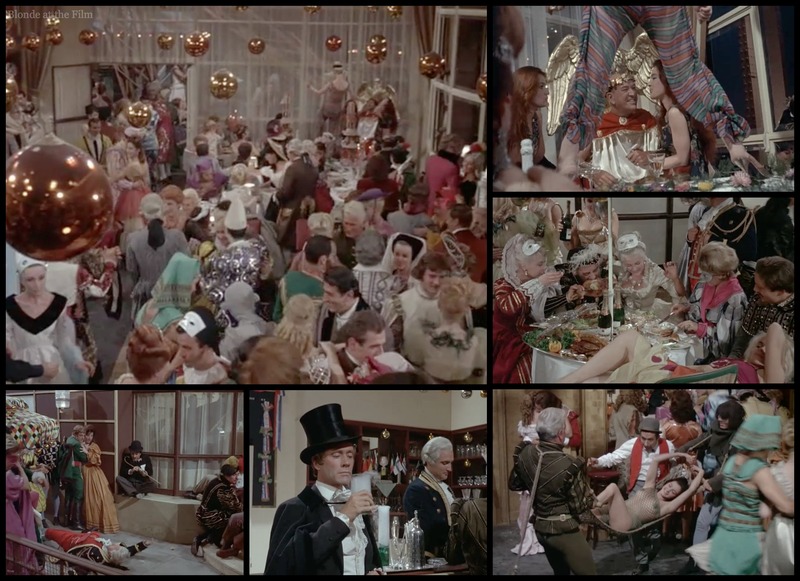 The party is an excessive, lascivious gathering featuring a cameo by Hepburn’s husband Mel Ferrer (as Dr. Jeckyll/Mr. Hyde), a Charlie Chaplin Little Tramp impersonator, Alexander Meyerheim as the producer, and some dancing ladies. Rick makes his play, despite the policeman watching his every move. What will happen? Does Miss Simpson have a tendency to fall for damaged men because she thinks she can change them? Is Richard really all washed up? Will anyone pay him to write a movie after all of that hogwash? 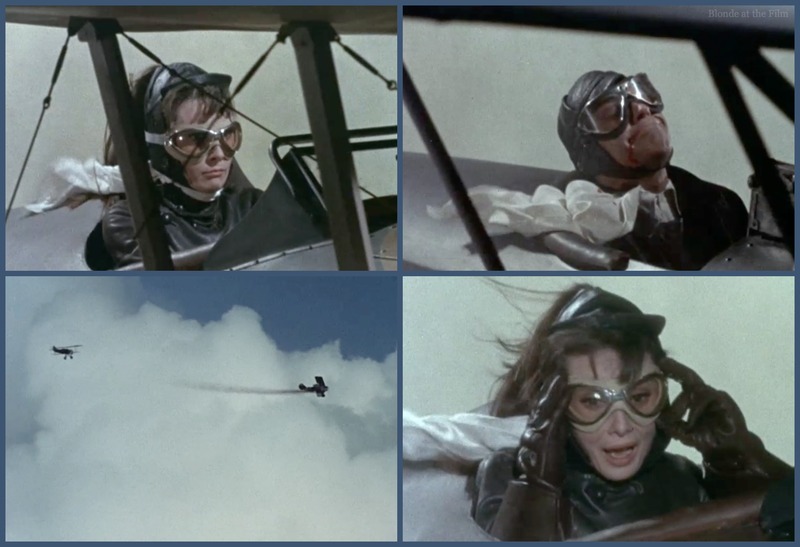 Hepburn later said that this was one of her least favorite films, although she enjoyed making it. Production started off a little rocky for her, though; she saw the dailies and thought she was being filmed in a very unflattering way. So, she lobbied to have cinematographer Claude Renoir fired from the film. Renoir was the grandson of Pierre Auguste Renoir (Impressionist master) and nephew of Jean Renoir, extremely famous and important filmmaker. You can imagine the uproar Hepburn caused–you can’t fire a Renoir in France! The unions threatened to strike, but to his credit, Renoir negotiated a truce and helped get Charles Lang hired to replace him. 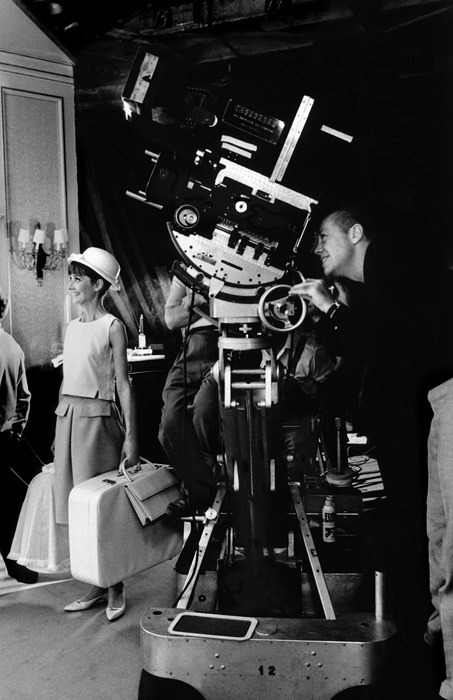 Lang was the cinematographer on Sabrina, and Hepburn liked the way he filmed her, so she was happy. Production continued! 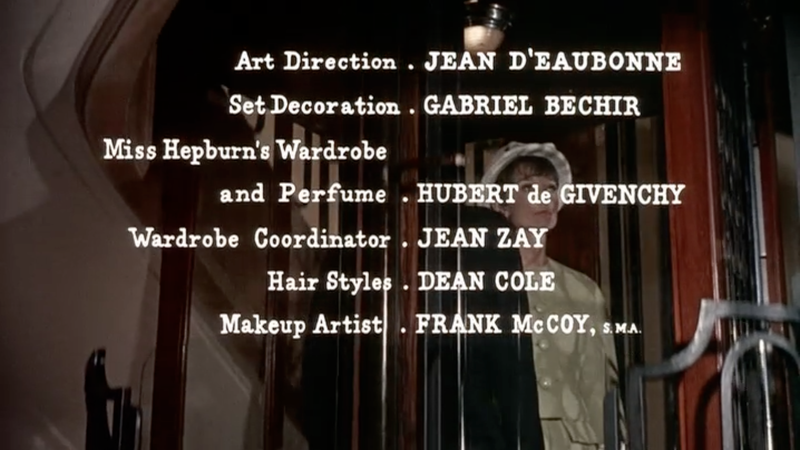 Fun fact: Lang also worked on Charade and How to Steal a Million. 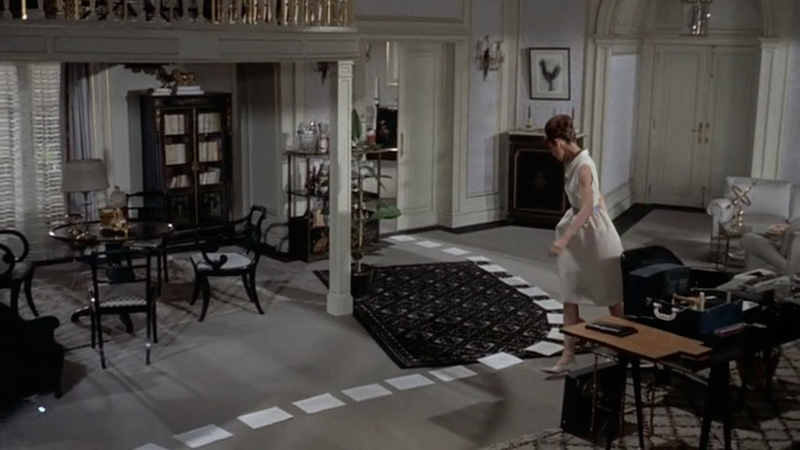 Fun fact: Just two days after finishing production on this film, Hepburn began work on Charade (1963) with Cary Grant. 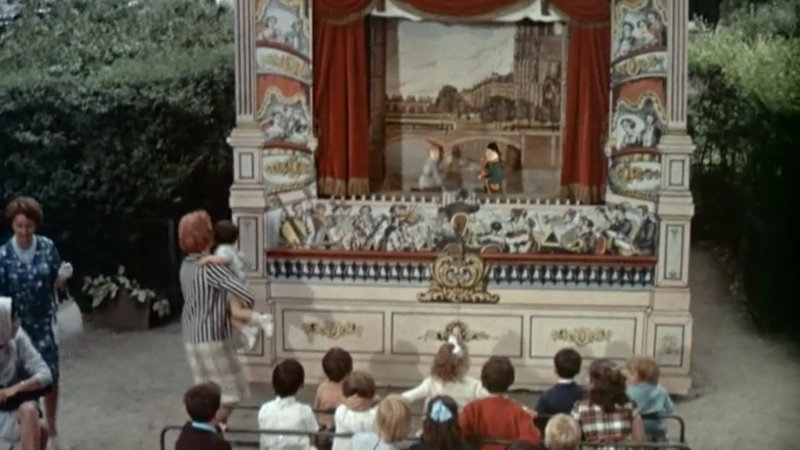 It also took place in Paris, and shares some locations with Paris When It Sizzles; for instance, the same Punch and Judy puppet theater near the Theatre Marigny appears during the credits of Paris When It Sizzles, and there’s a fairly long scene there in Charade. 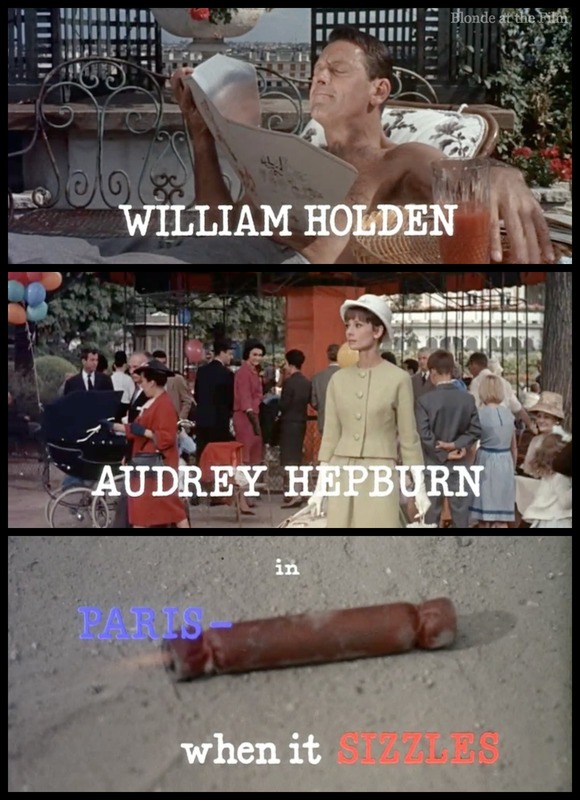 If you’re looking for one of the less famous Audrey Hepburn films, and you like references and meta-commentary, and an art-imitating-life-imitating-art with movies within movies, this is the film for you! Here’s the trailer, enjoy! For more, follow me on Twitter, tumblr, pinterest, Instagram, and Facebook! As always, thanks for reading, and you can buy this movie here. Thanks, Jay Bee! I really didn’t like it either but it has grown on me! Glad you enjoyed the post! I haven’t seen this film, but it sounds like one of those projects where a bunch of clever undergraduates toss ideas and laugh at their own jokes and don’t take the time to step back and see how it really plays. Still, I’m curious to see it; it does sound like an American attempt at a New Wave film while simultaneously sending up New Wave filmmaking, without making up its mind what it actually wants to be. That’s a great description of the movie! Thanks for reading! Let me know what you think if you watch it! ‘an affair which Holden never seemed to completely get over…’. Can’t blame the chap. Obviously that look in his eyes towards the end of The Wild Bunch was not just ‘acting’. Have yet to see this film, but look forward to doing so after your wonderful breakdown. He’s one of my favourite (and always forgtten about, in some ways) actors and watching Audrey on screen for a couple of hours is as good as any eye balm. Glad you enjoyed this review, Niall! Holden is pretty amazing, and you can’t go wrong with Miss Hepburn! Thanks for reading! This picture is a guilty pleasure for me. Not so hot, but I like it lots. That Face was written by Lew Spence and Alan Bergman for Fred Astaire and recorded in 1957. Mr. Bergman was courting his future wife Marilyn. She loved Asatire’s voice. That sealed the deal. They married. Alan and Marilyn that is. Thanks, Charles! Thanks so much for reading! I’m simply MAD for Wm Holden. What a sad ending was his. Alcohol screws up lots of people’s lives. He was wonderful to watch! Very sad. A fantastic post on a fabulous blog. Forgot to mention…great stills ! This post was actually written by me on TheBlondeAtTheFilm.com and shared by James on his site, but I’m glad you enjoyed it! Thanks for reading! Great review! The reason why I mostly enjoyed this movie when I first saw it (although it hasn’t got a BIG place in my heart) was because of the many movie and show business references, of course, but also because I could relate to the struggle of writing lousy and extremely far-fetched first drafts, being an aspiring filmmaker and writing story ideas myself. Thank you! That’s a great point; it does have a lot of fun “insider” stuff about the industry and writing!